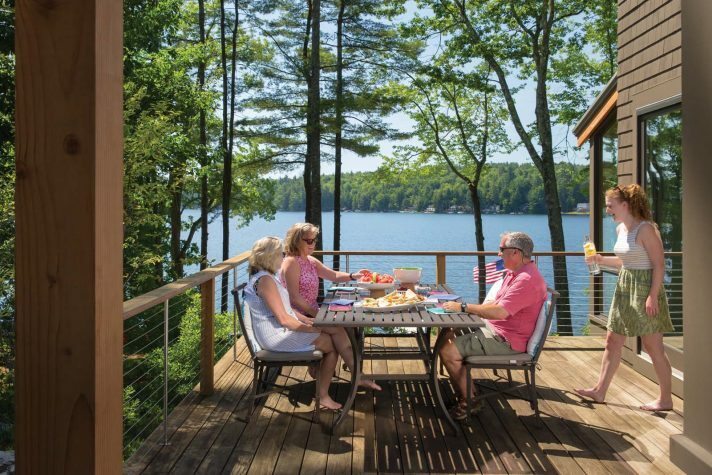 Homeowners Karen and Andy Coppola repurposed a lakeside home, leaving its basic shape intact but incorporating a side deck and one-story addition for a new entry and ground-floor bedroom. 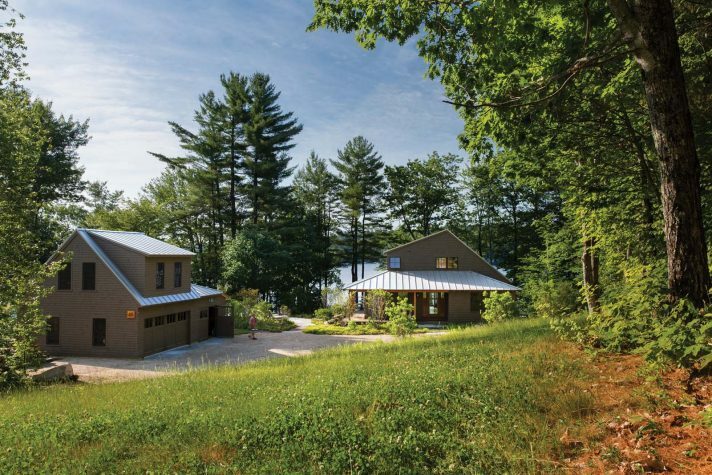 The standingseam metal roof and eastern white cedar cladding are new, as is the extensive landscaping, all designed to give what had formerly seemed like a suburban property more of a camp feel. 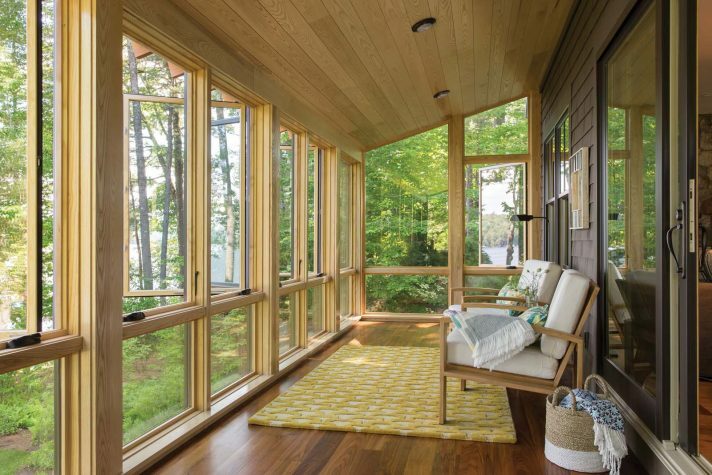 The original enclosed porch obscured the lake view, so it was replaced with a glassed-in sunporch with a red walnut floor. The ceiling and trim are ash. The kitchen sink is sited to maximize the view, which is of a meadow and a classic New England barn. Painted nickel-gap paneling covers the kitchen wall, and natural ash nickel-gap lines the sizeable pantry to the left, which also has an office nook. The cabinets (both painted and natural) are a Shaker-style flat panel with handles and knobs of a polished bronze. The countertops are Heritage Valley granite from Morningstar Stone and Tile. The paintings are by William Crosby. The owners’ bedroom has an ash accent wall. The bedding is from Pine Cone Hill, and the painting is by Jenny Prinn. 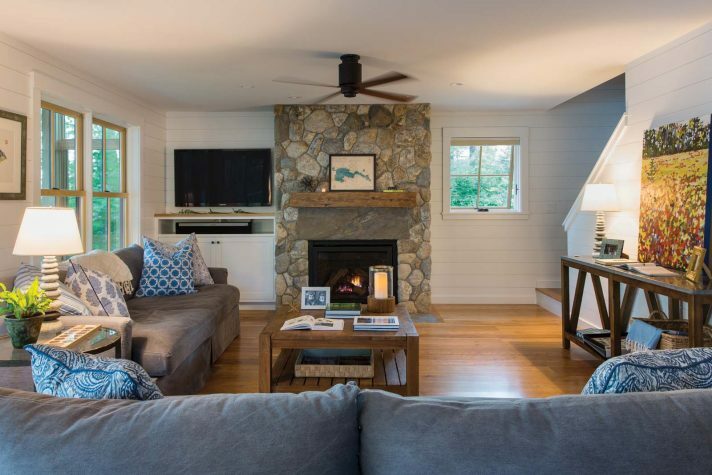 To make the camp feel more rustic, Whitten Architects and Douston Construction added a fieldstone chimney with a slab of granite for the lintel and an old barn beam for the mantel. An additional window at the base of the staircase was added for ventilation but also as part of a plan to balance glare off the lake. The painting to the right is by Holly Lombardo. Friends and family gather around a fire pit made of weathered granite boulders. 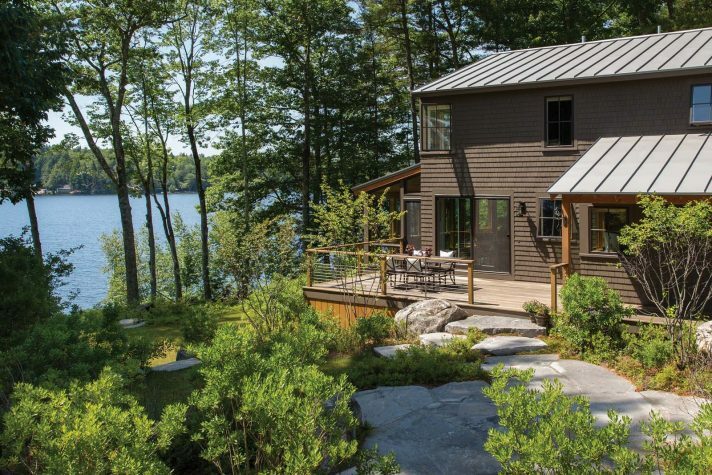 Surrounded by blueberry and huckleberry bushes, the clearing is one of many exterior “rooms” that landscape architects Richardson and Associates of Saco created on the lake side of the house. A different space has Adirondack chairs overlooking the water. Still another has a small lawn for playing bocce or croquet. The second-floor landing opens onto a bunk room featuring new windows and beds with under-mattress storage. The ash drawers obviate the need for dressers elsewhere in the room, keeping the space open. The beds and the side table are from Huston and Company. The rug is from Angela Adams in Portland. The chair is a vintage piece. The bedding is from Pine Cone Hill. The fuzzy pillows are from Wayfair, and the stuffed animals are from Daytrip Society in Kennebunkport. The paintings are by Ann Sklar. The owners enjoy dining on a new wraparound deck, which is made of ipé with red cedar handrails and a cable railing. There was a problem with the Maine camp that Andy and Karen Coppola bought in the fall of 2012. It didn’t feel like a Maine camp. Yes, the lightly forested land was bordered by a meadow and a beautiful lake, reportedly one of the three cleanest in the state, and, yes, the water has surprisingly and deliciously balmy temperatures for swimming. But the home, as architect Russ Tyson of Whitten Architects in Portland says, “had no sense of place.” The actual structure and surrounding lawn “could have been anywhere in suburban America.” What’s more, the site’s poor drainage and storm management was working, however unintentionally, against the health of the property’s greatest asset. When it rained, water rushed down the hill of the driveway toward the entry porch, where it collected and created unsafe ice and mud slicks. Meanwhile, the overflow washed around the foundation, eroding the earth and carrying whatever pesticides or herbicides the lawn may or may not have been treated with into the lake. 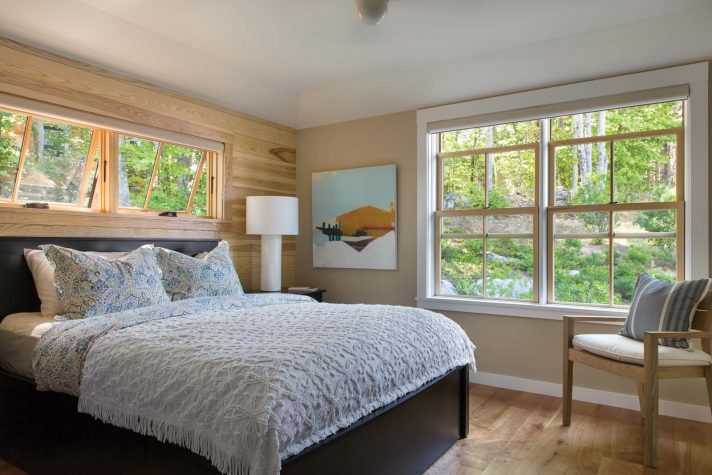 Although Maine shoreland zoning laws didn’t allow for a sizeable addition to the original footprint, a modest expansion permitted reorganizing the floor plan, so the ground level at present accommodates an owners’ bedroom and bath. Meanwhile, the second floor has a landing that is also a bunk room with two sleeping berths fitted under the roof’s eave. 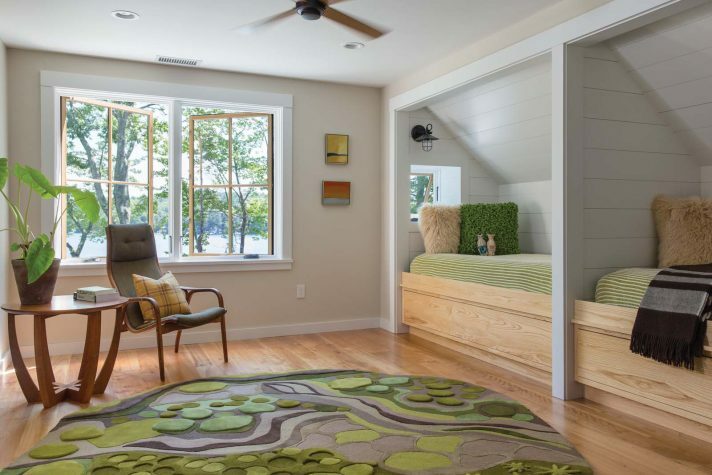 This space (kept neat with the help of ample storage in large drawers under the beds) is a favorite of the Coppolas’ children. Guests tend to stay in the two small adjacent bedrooms. The basement has a mechanical room and a game room/den with a bar of corrugated steel and wood that Andy made himself. Here, the emphasis is on classic lakeside fun. Bathing suits and life jackets hang on the wall to dry. Painted oars perch on hooks made of tree branches. Game boards have been framed as artwork but can be taken off the wall for play, the game pieces cleverly hidden within their thick frames. The primary gathering place is the first floor, which is a large L-shape that contains the living room, dining room, and kitchen. 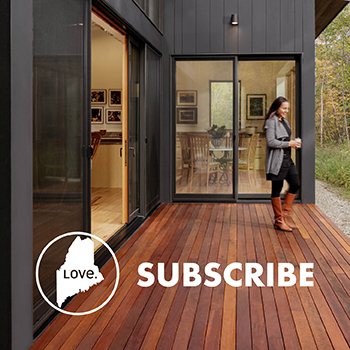 A new sunporch, which extends the communal space, brings the outside in, and floods the area with light. Inside, the house is decidedly modern and uncluttered (thanks to all the custom built-ins) but also “campified” with wood and stone. “The materials further tie the house to its place,” says Jessie Carroll of Whitten Architects of Douston’s interior work. Walnut and red birch are used for floors, and ash for accent walls. 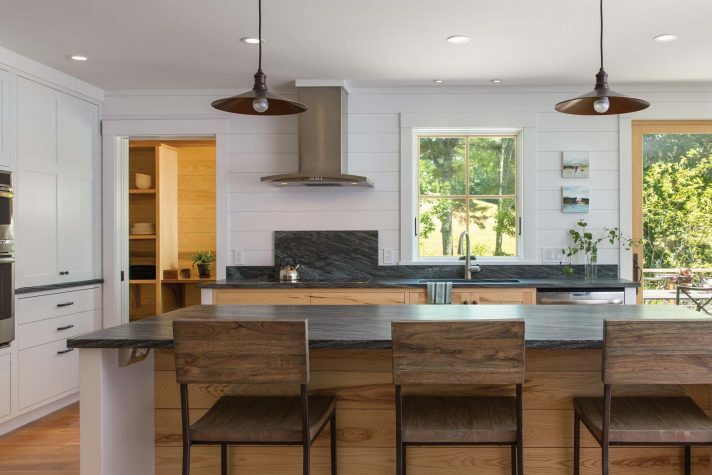 The kitchen island’s top is made of Heritage Valley, a Maine granite from Morningstar Stone and Tile, and the living room fireplace is composed of fieldstone with a slab of granite for the lintel and an old barn beam for the mantel. Nickel-gap paneling (sometimes painted white and sometimes left natural) adds visual interest to walls throughout the house. 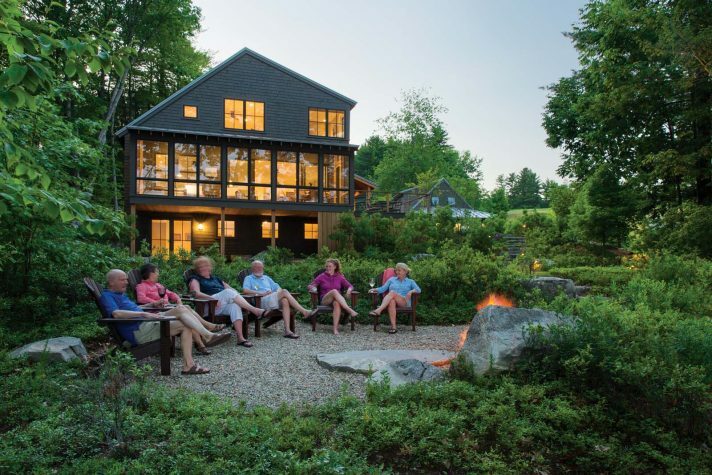 Outside, Richardson and Associates’ landscape plan created multiple “rooms”—a clearing for lawn games, a gathering space with fire pit, a flagstone terrace with Adirondack chairs, and a dining area—while celebrating and protecting the location. The award-winning plan by landscape architects David Maynes and Todd Richardson brought in native wild sods, low-bush blueberry and huckleberry, sweet gale, and hay-scented fern. Creating a buffer against erosion, the new plantings look as if they have always been there. Among the ways that Richardson and Associates managed storm water was what appears to the untrained eye to be a fern- and boulder-filled creek bed but is actually creative grading that allows small pools to catch sediment and other matter as water flows downhill toward the lake. As Maynes says, the feature, located on the less traveled side of the house, does not scream, “Look at me!” Rather, it suggests the natural way the land has eroded over the years, especially because the boulders already have lichen and moss on them. These weathered boulders appear elsewhere on the property to define walkways, enclose spaces, or simply serve as seats. Another clever site detail: roof runoff supports the growth of the haircap moss planted around the house, and, in return, the moss minimizes rain backsplash on the exterior walls. A new mudroom features large-format porcelain tile and extensive built-in cabinetry by Kennebunkport’s Huston and Company, which specializes in custom residential, academic, and library furniture. 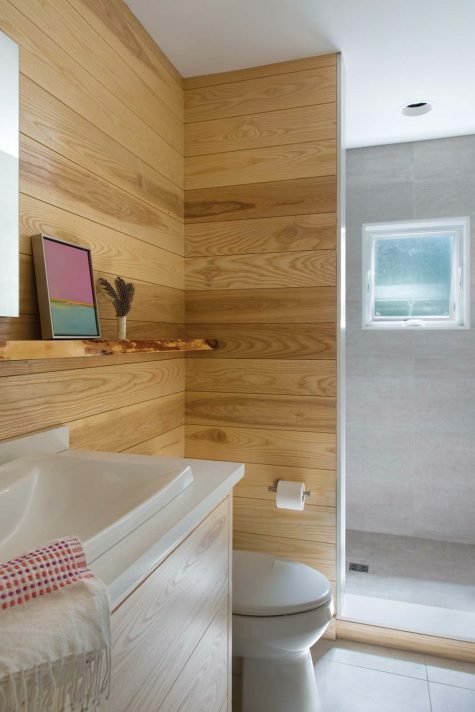 Owner Bill Huston explains that the natural ash used here reveals the heartwood, which is the darker part of the tree, and the grain (which is matched to run continuously across the drawer fronts) is part of the design. The pillows are from Angela Adams. The painting is by Jenny Prinn. A live-edge shelf hovers on an ash accent wall in a bathroom that serves as both powder room and owners’ bathroom. The vanity (like the cabinets and built-ins throughout the house) are by Huston and Company. The painting is by Ann Sklar. 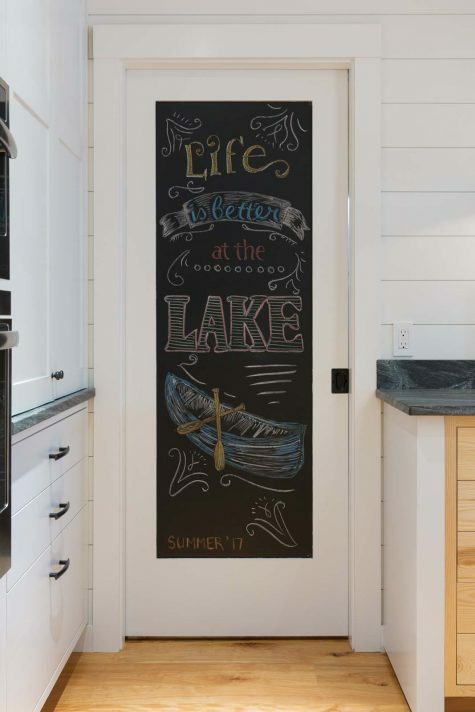 Blackboard paint allows a kitchen door to celebrate the beautiful lake location.